As a parent, nothing is more exciting than seeing your child’s gummy smiles for the first time. Over the next few months, baby teeth will begin to erupt, increasing the enjoyment as you see them grow and develop. While the sight of it can seem like one of the best moments in the world, caring for that smile is important as well. Although the primary teeth eventually fall out, they serve a vital role in their ability to chew and speak. Not to mention, they help to set the foundation for their future oral health. 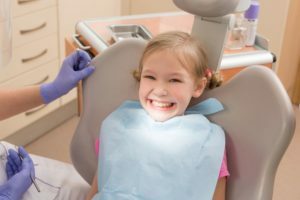 To nourish their development, it is best to start oral hygiene habits while they are young while also scheduling a visit to their children’s dentist in Bowie before their first birthday. By the time your child is three years old, they will have 20 primary teeth, which will eventually fall out to be replaced by permanent ones. Although the baby teeth do not last forever, they have an important job while they are in place. Baby teeth are critical to their development and health as they allow them to learn how to chew, speak, and smile. In addition, they act as placeholders for the adult teeth, which are forming below the gums. When a primary tooth is lost, an adult one will erupt to fill the space. However, if the baby teeth are not healthy or are lost too soon, it can lead to complications with the permanent ones, such as overcrowding. To foster your child’s dental health during their life, it is best to start oral hygiene habits before the first tooth erupts. Use a soft wash cloth to clean the gums. This not only removes bacteria from their mouth, but also gets them into the habit of caring for their teeth. As they begin to come in, introduce a toothbrush and dental floss. Take the time to brush their teeth twice a day and floss in between each tooth. Before their first birthday, it is time to schedule a preventive appointment with their dentist. Although only a few teeth are present, it provides the dentist with the opportunity to monitor their dental health and development while also building a trusted relationship with your child. In addition, they will discuss how you can better promote their oral health through hygiene habits and a balanced diet. They will also take the time to listen to your concerns and help you address bad habits that can hurt their teeth, like thumb sucking. While the baby teeth eventually fall out, the care they receive is important to their health and development. Take the time to invest in your child’s future by making their oral health a priority. Ambiance Dental Spa strives to create a spa-like environment for patients of all ages. We will help you set the right foundation for your child’s future with the right dental care. If you have any questions about their oral health or hygiene habits, please contact our office today to schedule a consultation.